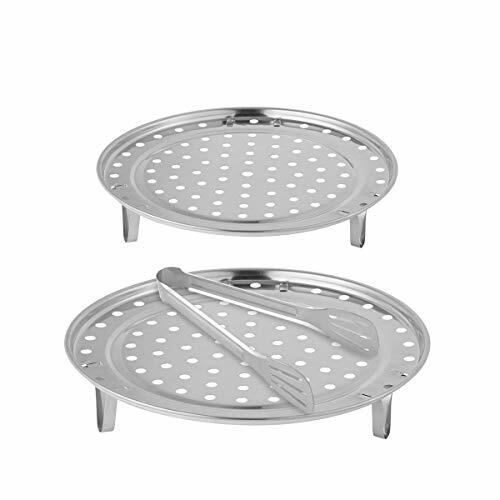 * Food grade stainless steel,durable and rust resistant. * Detachable Legs design,no need to add water all the time or worry about the water boiling up onto the food. * Our racks are compatible with Presto (TM) 01781 23-Quart,All American (TM) 21.5-Quart,T-fal (TM) P31052,Granite Ware (TM) 0730-2,Mirro (TM) 92122A and more. * Multi-purpose cooking tongs:suitable for daily use to pick up salad,slices of food,toast bread,steak it also can be use as barbecue grill tong stove tong,party pastry serving tong.